January 6, 2017, 7:52 AM · Earlier this week I posted a video about bad habit prevention, and one of the many habits I wanted to encourage was the regular rosining of the bow. A few months ago, I actually had a student that had stopped rosining altogether. It took me a while to understand that this was the reason for her ever-weakening sound! Off the top of my head, I suggested 10 swipes of rosin -- and many people disagreed! I suspected that perhaps 10 swipes was indeed too much, but I wanted to check. Since I have been playing for some 40 years and have a pretty brainless rosin routine going, I thought I'd just do a little test: rosin my bow in the same routine that I do every day, and count the number of times the rosin goes back and forth. To my surprise, I actually did more than I thought: 12 little swipes followed by two big ones at the end. (I'm counting each way as a swipe, so one is up, two next down, etc.) This did not actually feel like over-rosining. For this vote, I'd ideally like you to go rosin your bow in the normal way, and count how many ups + downs you do. Then give us the total number of rosin swipes in the vote. You may surprise yourself! Also, for scientific minds that what to know, make note of whether they are big or small (you can mention this in the comments or just enjoy the new information). What exactly is the right way to rosin, and how much do you need? It depends a lot on the pressure you use, and the rosining technique. I've been told that it's better to go all the way from the frog to the tip, when rosining. In practice, as I confessed, I do a combination of short and long swipes. Of course, rosining can reach a point of diminishing returns quite fast; you don't need an over-sticky bow that is creating a cloud of white powder around you while you play. Conversely, if you don't rosin your bow, you can't make the string speak. Some rosins do the trick with less application than others. What are your thoughts and advice about the amount of rosin to apply and rosin in general? January 6, 2017 at 03:04 PM · Six, between short and long swipes, once a week before playing in our church. Put too much rosin on though, and you can hear it. I remember the great bass player Gary Karr had one rule at bass camp: you had to raise your hand and ask permission to rosin your bow! Most often the request was denied. January 6, 2017 at 04:02 PM · That's interesting, Scott, I wonder what the mechanism is there, between humidity and the need for rosin! I use a lot of pressure when I apply the rosin (as much as possible without making the hair touch the stick), which seems to make it stick faster so I only need 1-3 swipes. The rosin I use, Andrea a Picare, is middle of the road as far as stickiness goes. I used to use more swipes when I was using Goldflex rosin (3 or 4 swipes every day, no exceptions), which seemed to produce more dust too so maybe it was coming off faster so thus I had to put more back on every day. What brand do you usually use? January 6, 2017 at 04:25 PM · For myself, I only do 2-3 swipes and I use Andrea Bang solo rosin. But I will often tell my students to swipe 10 times as they usually use the cheap rosin that comes with the rental and it can take that many swipes to get a little onto the bow. January 6, 2017 at 05:02 PM · I never count my rosin swipes. January 6, 2017 at 05:24 PM · I don't necessarily swipe. I put more rosin where I need it, and less where I don't. And, it depends on the weather, and if I'm playing indoors, or outdoors. January 6, 2017 at 05:52 PM · I've cut way back on the rosin recently. I'm using a Pirastro light color rosin and find that 5 full bow length swipes with firm pressure gives me enough rosin for a 2 hour rehearsal or concert. I always wipe the excess from my strings and violin at break. There is usually enough rosin left on the bow for another hour or two of playing which comes in practice sessions at home. January 6, 2017 at 05:55 PM · If I was swiping rosin I wouldn't admit it.?? But seriously, much depends on how firmly you press while rosining. I typically do four strokes, but they are slow and firm. January 6, 2017 at 06:34 PM · Being a returnee adult student I still rosin my bow the way I was taught as a child - that is, rosin the frog area with little back and forth motion then go up the bow and do the same thing at the tip, then back down again. So in essence I am only rosining the full length of the bow 2x. Honestly I only rosin the bow 1x a week. You guys are probably shuddering in horror at this fact, but since my schedule only allows about 4h a week of practice time + 1 hours lesson + 1 hour of orchestra, I really haven't felt like I need to rosin more. EDIT - I live in upstate NY in Adirondack area. January 6, 2017 at 06:46 PM · I do maybe 3 full length swipes, and only rosin once, maaaaaybe twice per week. Sometimes less frequently. Maybe Scott's theory explains it, since Colorado is pretty dry. January 6, 2017 at 07:52 PM · Christian, I'm in Colorado too, so that must be part of it. I rosin with the same kind of strokes I normally play with and I'm not afraid to apply too much rosin. A little dust is OK but the sound problems from not enough rosin are worse. If you see a little puff of rosin occasionally on an attack, that's not the end of the world. January 6, 2017 at 08:54 PM · Wait what is summer and winter rosin? January 6, 2017 at 09:15 PM · Summer: harder and brighter-sounding. In Leatherwood's world, crisp. Winter: softer and darker. If it's cold and dry out, rosin needs a bit of help getting spread around. For all of these, LONG swipes. Rapid and short melt the stuff more than you realize. January 6, 2017 at 10:10 PM · Prior to tuning at the beginning of the practice day, I usually hold the bow hair side up, up to the light (looking lengthwise along the hair towards a lamp, or outdoors if its a very sunny day - if the hair is shiny, then I usually do 1-3 swipes, and then I hold the bow up to the light again - if there is a shiny part, I then rosin that part with short strokes up and down, and recheck until it all looks even and no shiny spots. If I'm playing a lot, I'll do this again in a day, but usually that is enough to last for a day. I either use Lautenbacher, Jade, or Baker's rosin. Jade has a smoother sound, the other two have more of a grip. I remember in college, when I had my first lesson with Eddy Brown (an Auer pupil). He looked at my bow and said, "Don't rosin your bow until I tell you to." I think it was at least 2-3 weeks before he told me to. Prior to that I had really used a lot of rosin - probably 10 swipes every time I took the violin out of the case! At that time I was using AB or Hill rosin. Im currently using Gustave Bernardel Colophane (?) I got from Robertson and Sons here in Albuquerque, and really like it. I was using some generic brand before and had all this cake on my instrument and strings - it was terrible! I have had teachers tell me that I will know when I need to rosin (From a sound standpoint), and, honestly, I do once a week and have been happy with how I sound - well, as well as a "2 year old" could sound I suppose ;). My body is 46, however LOL - or... is it 47... hmmmm. January 6, 2017 at 11:13 PM · Kimberly, when I started learning the violin, my teacher (who was a really nice man, but I now realize wasn't a very competent violinist) also rosined by loading it up at the tip and frog, and I did the same. But I ultimately came to realize that made no practical sense, and I switched to long, even, continuous strokes. JMHO. January 6, 2017 at 11:59 PM · I was once told : If you can see rosin on your violin under the strings then you are using too much. NOTE : I only swipe once per day (once up and then down) or even every two days. January 7, 2017 at 02:30 AM · Summer and winter rosin is like summer and winter gasoline. It's a way for the vendor to make more money. In another thread I observed that every discussion about rosining creates a "race to the bottom" to see who can claim to be using the least rosin. January 7, 2017 at 04:46 AM · I work in Riyadh, Saudi Arabia which is a very city. Humidity is around 10% during summer and 50% during winter. January 7, 2017 at 07:30 AM · What interests me more than # of swipes is how many--adv/pro--players who let the rosin crack against the frog, when simply covering the frog base preserves the rosin. January 7, 2017 at 08:20 AM · I play a lot with an incredibow (so much fun once you overcome the bounce! )and the nyon hair uses very little rosin - 3/4 strokes about twice a week with occasional "patch treatment" if the bow slips or I see a shiny bit. I play 2 -3 hours a day like this. My traditional hair bows use a little more rosin - certainly a more frequent application. January 7, 2017 at 06:02 PM · Is it just that dark rosin is "winter" rosin and light rosin "summer"? Or is there more to it than that? Makes sense to me that temperature would affect rosin, and the dark does go on more easily. I have a cake of dark, light and "Magic" in my case and switch off rather unthinkingly, to be very honest. I probably use less swipes with the dark and more with the light. It would be useful to have someone with a non-biased agenda and scientific-reseaarch background do an evaluation of current rosins on the market. Some categories could be price, sound fullness or intensity production, grittiness [rapidity of sound production], dust production, convenience and product protection [container]. etc. Some questions to answer: what difference does color make? any objections or benefits to using bass rosin on a violin bow? Actual benefits of expensive products and other than marketing; is their a more expensive process to creating "better" rosin? January 7, 2017 at 08:35 PM · I only add rosin when the bow starts losing its grip. I have used Pirastro, Hills, Kaplan and others. For most of them I can't tell much difference. However, I recently began using Liebenzeller Gold II rosin. It seems to give me a mellower tone that any of the others. I usually make 5 or 6 - 2 way swipes. I have another very sticky rosin that I use in ensemble playing when I am the lone viola and have to make my sound come through against multiple violins and cellos. Unfortunately I have forgotten its name and the leather wrapper it came in doesn't give a clue. January 7, 2017 at 09:15 PM · My teacher once told me that humidity affects rosin. Since winter has less humidity, dark rosin works well. Summer usually has greater humidity so light rosin performs better. Since cleaning excess rosin needs to be cleaned off my instrument, I tend to act on the lazy side of things and use a minimum of rosin when playing. :) (Perhaps 1-2 swipes a day). I think this subject could be another great future article by Laurie! January 7, 2017 at 10:25 PM · I use a fine, moderately 'grippy' rosin, applying every day if practicing heavily. I put on too much and then begin warming up, using a clean cloth to wipe off excess. January 7, 2017 at 10:53 PM · I'm like Kimberley and Mark. I still rosin my bow the way I was taught as a child, many years ago. I use a lot more rosin at the tip and frog than at the middle. Is this really bad? I notice that the part of my bow near the frog gets dark and slippery more often than the rest of the bow does, so I believe that it needs more rosin. I do not rosin routinely, just when I notice that the bow or parts of it become more dark and / or slippery. I can feel and hear the difference in bow control after I use rosin. January 7, 2017 at 11:17 PM · I would have thought that the middle of the bow which gets used a lot more would require more rosin. The frog and the tip should require less. Why are people taught the opposite of this ? January 8, 2017 at 12:10 AM · One reason why people are taught to rosin a lot at the tip and frog is because at the tip you've got the least intrinsic pressure (oops .. I mean "weight") so applying more rosin might help gain a little more friction. And at the frog you might not need a lot but you can tolerate it because that's where you're playing your most aggressive strokes. Or it's because otherwise if someone just rubs the rosin up and down on the bow the might tend to avoid the frog because otherwise you'll suffer an inevitable scolding from the rosin-chipping police, and you might tend to apply less to the tip because there is less intrinsic "weight" there. I suspect the reason a lot of pros have chipped rosins is because they share their rosin occasionally at rehearsals, or because they have other more important stuff to care about. I use about 1-2 swipes every six months or so. January 10, 2017 at 07:56 AM · In a podcast from Rachel Barton Pine, the head engineer at Thomastik (makers of Dominant strings) suggests, that when you think you need to rosin your bow, that you should instead take some 0000 steel wool and clean the rosin off your strings. After doing this, you may find that the bow still has sufficient rosin and does not need to be re-rosined yet..
January 10, 2017 at 07:01 PM · I give the bow about six swipes, mostly full length but perhaps with a couple of shorter ones if I feel the urge. I want to be sure to get the entire length of the hair, though - especially now that my warm-ups work up to doing a 3-octave Galamian scale (24 notes) in a single bow stroke. January 13, 2017 at 12:48 PM · So my question to Charlie would be, why is it better to do 6 swipes ever three days than two swipes per day? Wouldn't that give a more consistent quantity of rosin throughout the week? 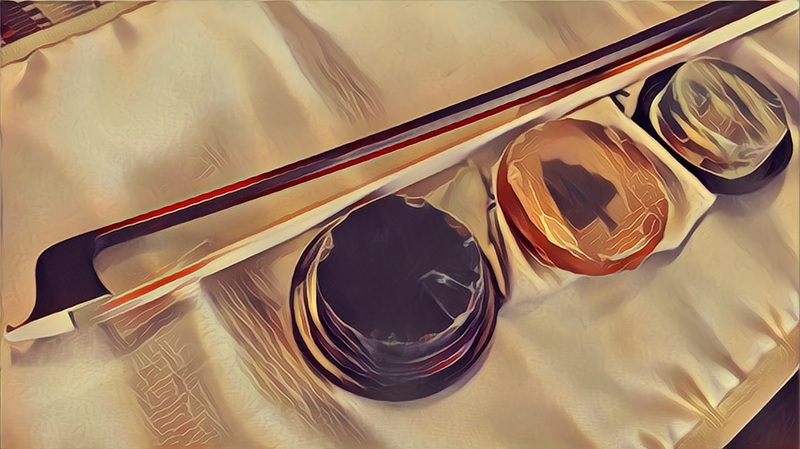 January 13, 2017 at 02:52 PM · I find myself putting quite a bit of rosin on my bow depending on what piece I am playing. Some music seems to literally shave the rosin off of my bow. Like Richard Meyer's original pieces (Incantations/Rosin Eating Zombies...), the Verdi Requiem, Hindemith Viola solos and many rock pieces arranged(well) for orchestra. Those pieces often get me doing up to 20 swipes of rosin. Some pieces require much less rosin, and sometimes just relying on the same rosin from the last time I played. In conclusion, I think that it depends.